The Calendar of Events for May 2009 will appear later today. Thank you for your patience. STEILACOOM, Wash. – For 77 years, patients who died at Western State Hospital were buried in graves marked only by numbers stamped in bricks of cement. It wasn’t about money. It was about shame. And it was about the law. The state sought to protect families from the stigma of their relatives’ mental illness by barring state psychiatric hospitals from putting names on the graves. Read here to discover how the Grave Concerns Association is rectifying this issue. Seventy-three years ago - as the Great Depression dragged on - a migrant farm worker struggling to raise four children after the death of his wife made a momentous, life-changing family decision. He felt he couldn't care for 10-month-old Simon along with the other three children, so he gave the boy up for adoption. Raised in the Rio Grande valley of Texas as an only child, Simon Martinez was going through old family trunks in 1978 after his parents died when he found a box with a handwritten note inside. It was from his birth father, describing the agonizing decision he had made. Read more of the story, including details of how Martinez's adoptive cousin used genealogical research to find his birth family, here. SALT LAKE CITY—FamilySearch volunteers reached a monumental milestone this week, transcribing their 250 millionth historical record. The incredible online initiative started in January 2006 with a few thousand volunteers and has now grown to be the largest Web-based initiative of its kind with over 100,000 volunteers worldwide. The 250 millionth record was part of the current Nicaragua Civil Registration indexing project online at index.familysearch.org—one of 45 projects being indexed by online volunteers. It was extracted by three different online indexers from Nicaragua, Guatemala, and Honduras. SALT LAKE CITY—FamilySearch expanded its Knowles Collection—a free popular database of Jewish records hailing from the British Isles. The collection builds upon work commenced by the late Isobel Mordy—a well-known historian of the Jews of the British Isles. This is one of several press releases I've received in the past week or so. My apologies: I've been remiss on posting them in a timely manner. 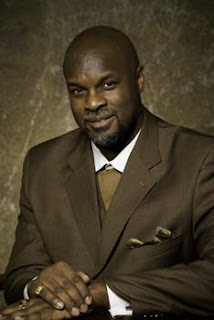 Dr. Tukufu Zuberi is heading in to his seventh season with the hit PBS television show History Detectives. And through the years, many stories he has investigated have stood out to him. But when asked for a favorite, one in particular came immediately to mind. "It was a story about Sam - the first black ventriloquist dummy to appear on Broadway. It led me to do the genealogy of this dummy. Where did it come from? Was it related to Charley McCarthy?" Zuberi laughs at the thought, and yet it was a fascinating adventure to track Sam down to a shelf in the kitchen of the daughter of the man who had operated him on the vaudeville stage at the turn of the century. But of course in addition to Sam's genealogy, Zuberi has much to say about the journey we are all on to discover our own family history. There are many new, upcoming, and completed indexing projects to report in this update. There are 12 new projects (see Current Projects chart below). These include three Belgian and two Argentina projects. The New York 1892 State Census project will be of great interest to many people. FamilySearch could not do all of these great initiatives without the great time and effort contributed by so many terrific volunteers. Thank you for your continued support. FamilySearch added over 16 million new indexed records and almost 500,000 new digital images this week to its Record Search pilot (see chart below). Seven new states were added to the 1920 U.S. Census index (Arizona, Arkansas, Colorado, Connecticut, Florida, Illinois, and Massachusetts). Four counties (Clay Crittendon, Desha, and Monroe) of Arkansas marriages have also been published and includes the indexes and the images. The Arkansas records date from 1837 to 1957. Many thanks to our good friends at the Arkansas Genealogical Society and other FamilySearch Indexing volunteers who help make these priceless collections more readily available online. See the chart below for more details. The new records can be searched for free at FamilySearch.org (Click Search Records, then Record Search pilot). Comments: NEW-—4 counties (Clay, Crittendon, Desha, and Monroe). Result of joint initiative with the Arkansas Genealogical Society. John Pfost is pleased to announce the release of his new book the Webmaster’s Guide to TNG 7.0: From Novices to Experts. This book provides all of the information needed by genealogists to easily build and manage dynamic, database-driven family history Web sites using "The Next Generation in Genealogy Sitebuilding.” TNG - as it’s commonly known - is the world’s preeminent software for creating custom, feature-rich, expandable, secure, and collaborative family history Web sites. Unlike conventional desktop genealogy programs that build Web sites by converting GEDCOM files to HTML Web pages and then uploading all of the pages to a Web server, TNG allows users to upload a single GEDCOM file to a database hosted on a server. Web pages are then rendered dynamically based on requests by site visitors. Using cutting-edge technologies, the data is easily packaged for fast and efficient display including individual pages, family pages, family trees, media galleries, specialty reports, and more. More importantly, when the data changes – such as when you locate additional family members or extend the knowledge about your families – you do not need to regenerate all of the Web pages from the GEDCOM file and then re-upload them. You or your designated site users can modify the data directly in the database. TNG comes with a number of pre-built templates that can be applied as-is, or customized in countless ways. You can change the theme, colors, layout, graphics, menus – pretty much anything that you wish – to create a stunning presentation and unique user experience. Even without any modifications, you will not end up with a canned and stilted Web site typical of those produced by desktop genealogy programs. What’s more, you are provided access to all of the source files so that you can further customize and enhance TNG to suit your needs. You do not need to perform any computer programming to work with TNG, but rather can simply tweak some code to achieve any desired result. Because of the vast capabilities of TNG, many users find it somewhat challenging especially early on. The Webmaster’s Guide provides step-by-step procedures to get you up to speed quickly and efficiently. You can easily have a TNG-based family history Web site up and running in a weekend. What’s more, you’ll learn how to extend TNG’s capabilities to achieve nearly any existing Internet functionality. You can, for example, integrate slideshows, Wikis, forums, blogs, guestbooks, or integrate TNG with common content management systems. And, this is all in addition to controlling and managing your data – your genealogy – in a secure, user-friendly environment. ** “Introducing The Next Generation of Genealogy Sitebuilding” - provides a brief history of genealogy Web sites, an overview and description of TNG, a listing of its notable features and functions, a discussion of the underlying technologies, and a description of the system and personal requirements to implement a TNG Web site. ** “Getting Started with The Next Generation of Genealogy Sitebuilding” - provides a detailed description of the products and services one would need to develop a dynamic TNG-based family history Web site. It describes the key components - TNG, the Webmaster’s Guide, a domain name, and Web services hosting provider - that are required, as well as the many additional resources that are available. You can download these papers from the TNG-Resources site at http://www.tng-resources.com by subscribing to the TNG-Resources newsletter and then accessing the Additional Resources page. For additional information about the Webmaster’s Guide to TNG, visit www.tng-resources.com or email info@tng-resources.com. For information about The Next Generation of Genealogy Sitebuilding, visit http://lythgoes.net/genealogy/software.php. The April 2009 Scanfest will be held Sunday, April 26th, from 11 AM to 2 PM, Pacific Daylight Time. Scanfest is a time when family historians, family archivists, genealogists, and genea-bloggers gather to scan their precious family photos and documents while chatting with others about genealogy, preservation, and everything else under the sun! You can visit our March 2009 Scanfest to get an idea of what it's all about, here. On Sunday at 11 AM, PST, come right to AnceStories and you'll see the CoverItLive live blog/forum in the top post. It's not really a "chat room," per se, it's more like a live forum and anyone visiting this site can read and see what is happening in the forum. In addition, any other readers of this blog drop on by and view/read what is happening at Scanfest. If the 25 Participant spaces are full, those readers will not be able to comment, unless someone else drops out. If you would like to be a Producer, please e-mail me no later than Saturday, February 21st at 4 PM, PST and I'll send you an invitation. Preference will given to previous Scanfesters. You must set up an account (free!) ahead of time to be a Producer. This account will be good for all future Scanfests. You can do some practices ahead of time by going to My Account and clicking on the link under Practice your live blogging. Again, you must have IE 6.0+ or Firefox 2.0+ to be a Panelist. This week, two carnivals were posted. The 12th Edition of the "Smile for the Camera" Carnival was published April 15th at the Shades of the Departed Blog, with the theme being "A Noble Life." There were 20 submissions honoring the noble lives of ancestors, and the theme for the 13th edition will be "All Creatures Great and Small." The 70th edition (70! Can you believe it!) of the Carnival of Genealogy was published this morning at Creative Gene. "Uncle, Uncle!" was the theme, and 33 posts were submitted. "Local History" will be the theme for the 71st edition. Tim Abbott reports that the 18th edition of the Cabinet of Curiosities will be postponed indefinitely while he recovers from a case of pneumonia. We wish you a speedy recovery, Tim! Remember, there are three more carnival deadlines coming up in the next week or so: the 18th Edition of the Carnival of Central and Eastern European Genealogy - Easter and Passover Traditions (April 20); the 3rd Edition of the Graveyard Rabbit Carnival - Cemetery Preservation (April 25); and the 4th Edition of the Canadian Genealogy Carnival - Black Sheep Canadian Ancestors (April 26). Thomas should also be publishing the final installment of Bound for Mom - The World is Not Flat very shortly. I noticed that SeekingMichigan had twittered today that they had recently added more 1897 - 1920 death certificates to their database, for a total of around 600,000. I immediately went on to the site and within an hour had found and downloaded certificates for four more direct ancestors and three more collateral relatives. I searched for many others on my To Find list and am hoping they'll be added to the next uploaded batch. Running a search on my RootsMagic4 database shows that I have 151 family members who died in Michigan between the aforementioned years. This includes 24 direct ancestors, 10 of which I've so far found death certificates between my searches today and in the past few weeks. I'm looking forward to finding the other 14 in the future. 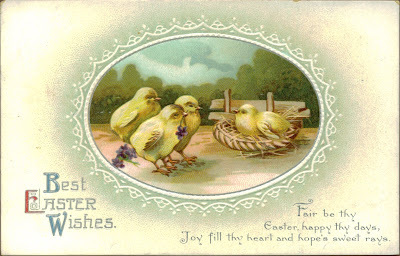 Best Easter Wishes postcard from Ole LERFALD to his sister Rena LERFALD. C. 1908 - 1920. Original privately held by Troy Midkiff, [ADDRESS FOR PRIVATE USE], Vancouver, Washington. 2009. Joy fill thy heart and hope's sweet rays. I've updated the February, March, and April Calendars of Events to reflect all the postings of carnivals and other blogging events, as well as events such as Data Backup Day and Scanfest. The February and March Calendars of Events can be used as monthly reviews, while the April Calendar shows both the most recent events posted as well as upcoming ones for the month. You can always select the Calendar of Events label in my sidebar to view all events going back to March 2008, when I published the first Calendar of Events post. Many other geneabloggers also publish upcoming events and event reviews on their blogs. RICHFIELD TOWNSHIP, Michigan -- As a 70-something-year-old man, Nathaniel Blackmer Sr. still was trying to prove that he served in the American Revolutionary War -- even traveling to Ohio for testimony from a fellow soldier. But the soldier died before Blackmer could reach him. Now, thanks to fresh research in the Internet age, Blackmer finally will be recognized for his service to the country -- nearly 160 years after the Flint veteran's death. Don't forget! Tomorrow, April 8, you can attend a free MyCanvas webinar: Creative Gift Ideas for Moms, Dads & Grads. John Pereira and Stefanie Condie will present meaningful gifts that you can make in an hour or two, including family tree posters, collage posters and photo books. The presentation will begin at 8 pm Eastern Time (7 Central, 6 Mountain, 5 Pacific). To sign up, go here. As my regular readers have probably noticed, I didn't blog much during the month of March. All right, I posted 27 items, but most were press releases sent to me from various genealogical companies and services. I didn't participate in any of the great carnivals last month, didn't write any deep or thoughtful posts, and was unable to pull my research together enough to write about a brickwall ancestor. Added to my work load and health issues was just plain old depression. We have had the most snow on record this winter, which was preceded by the third most snowy winter last year (we had only four months in 2008 that did not have some sort of snowfall). Spokanites are a hardy breed, but quite honestly, we're sick of the snow, the gray overcast skies, and the equally gray piles of frozen yuck standing around in parking lots. And in late February, as I've already shared, my husband received notice that his employer is closing the plant and outsourcing to subcontractors in California and overseas. It's not exactly been the most cheerful winter I've experienced. Spring Break was on the horizon and down I came with a nasty cold two days before the weekend. My modus operandi with colds is that they usually hit my throat and I get terrible laryngitis. I was scheduled to make two presentations at the biennial Family Trees and Ancestries Conference sponsored by the LDS Church in North Spokane on Saturday, March 28th. Although I had already used quite a bit of sick leave on my post-surgery recovery, I figured I'd better stay home and rest up so I wouldn't be speechless for the conference. Fortunately, rest was exactly what I needed and I probably recovered much faster than if I had tried to tough it out. The conference went well (although I haven't heard the official count, my guesstimate is that we had over 200 attendees), and despite my sniffles and sneezes, I had a voice. The first part of last week (Spring Break) was spent nagging urging my teens to complete unfinished work since third quarter grades will be posted soon, which they did with a lot of whining and resistance joy and compliance. We then left Thursday morning (amidst two inches of freshly-fallen snow) for the Vancouver (WA)-Portland (OR) area to visit my husband's family for the remainder of the weekend. I always enjoy the drive along the Columbia River because I love to imagine Lewis, Clark, and Sacajawea traveling along--and much later--the brave pioneers floating their covered wagons down the river on rafts. Washington State has such a variety of climates and geography, so there's much to see even though I've done this trip a thousand times, it seems: from the rolling wheat fields of Lincoln and Adams Counties to the vineyards and orchards of the Tri-City area, to the wild scab rock and coulees and the windy Columbia Gorge, to watching the climate change as you cross the Cascades from the dry side with sparse pine forests and sagebrush to the wet side with evergreens, moss, and thick undergrowth, to the behemoth Cascades themselves--Mt. Rainier (which you can see 250 miles away on a clear day), Mt. Adams, and Mt. Hood. Friday was spent visiting with my parents-in-law, who grew up in Western and South Central Washington and always have interesting stories to tell of their past growing up and the present going-on in the neighborhood. My kids especially enjoy listening to their grandfather talk about the times he's gone searching for Bigfoot. My mother-in-law put on her famous turkey dinner that she always serves when we visit and we ate 'til we were stuffed. Our kids enjoyed the four cats and the dog, as well as watching all the squirrels and birds that my father-in-law feeds in the backyard. Saturday morning, my daughter and I walked to the shopping district in downtown Vancouver, where we found a darling little boutique specializing in gently used and wholesale formal gowns. After spending months looking around Spokane and online, Missy found the dress that she loves, and I'll eventually be posting her prom photos next month on my personal blog. Later that afternoon, the four of us drove over the Columbia to the city of Portland, where Norm's aunt and uncle have a houseboat right on the river. After a delicious lunch, Norm's uncle invited the kids to use the kayaks. My daughter wasn't eager to try them, but my son was game. We've all used kayaks before--but on a small lake with little traffic--so Uncle R gave Matt some safety lessons and instructions before letting him head upriver against the current and then floating past the houseboat downstream again and paddling back "home." It's pretty amazing to see your "baby" out paddling a kayak on the mighty Columbia alongside tugs and other river vessels! Later, Matt and his granduncle took out a RIB, a rubber-inflatable boat, and because it was under 10 hp, Matt was allowed to drive it. We returned yesterday (Sunday) in deliciously warm weather. It was nearing 70* when we passed through the Tri-Cities. While in the Vancouver-Portland area, I had been admiring all the blooming trees and bulb flowers that were prolific, unlike the barren, stark (snow-covered) trees and shrubs at home. We were able to bring back the warm weather with us, and I happily worked on the yard after work this afternoon, trying to undo some of the damage and debris that winter had left behind. When I got online after returning home last night, I checked the genealogy news and was surprised to see that AnceStories had been listed in ProGenealogists' 25 Most Popular Genealogy Blogs, at Number Six! I'm honored to be listed among those who are so well-known in the genealogy world, and who write so consistently and with such incredible content. I'm certain that the main reason I'm included is because I happen to be at or near the top of many blog rolls alphabetically, so naturally I tend to be one of the first sampled by new readers. In other words, it's probably more chance than anything else, but again, I'm honored to have been chosen. As an aside, I noticed that Joe Beine had listed on his blog some updates for his Death Indexes website, including the Portland Oregonian newspaper search. Sure enough, I found a listing for Lynn WESTABY's obituary, which I plan to order through Random Acts of Genealogical Kindness! I'm not promising more frequent posts, deeper content, or research-motivated blogging any time soon. But I wanted to assure my faithful readers that I'm still alive and kicking, reading my fellow genea-bloggers' posts with relish, looking forward to the day when life is a little less encumbered, and my trains of thought mesh with free time to bring you more interesting reading ahead! 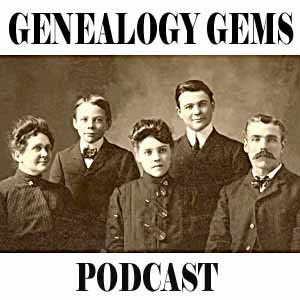 Posted April 18 - the 70th Edition of the Carnival of Genealogy - Uncle, Uncle! Please note: the 18th Edition of the Cabinet of Curiosities was postponed until host Tim Abbott recovered from illness. Stay tuned. Read the latest "Today is Backup Day!" post by Thomas MacEntee at Geneabloggers. courtesy of Thomas MacEntee of Destination: Austin Family.